Far from being upset or offended, when I read this graphic (helpfully posted in an Internet atheist community), I immediately thought of some people I’ve met since 2002, when I became a Christian. Those people exactly fit what this atheist declared. And it saddens me. In other words, to base one’s opinion on an entire faith based on the few people you’ve met is simply ludicrous and utterly without credibility. It would be like me reading news reports, then declaring that all Muslims are violent maniacs. See what I mean? It’s important to keep this in mind: even if a person is raised by Christian parents to have blind faith, that hardly means that person is simply going to go along with what they’ve been taught. Consider my story: raised in a nominally Christian home, my brothers and I were given the freedom (in our mid-teens) to decide for ourselves whether we would continue attending church. All of us promptly stopped and so did our parents. Eventually, many years later and after much consideration and thought, I decided for myself to follow Jesus. To this day, I’m the only Christ follower in my biological family. There are many more stories just like mine and many more that aren’t. Every story is unique, no matter what any critic of Christianity might declare. My life resembles much more a journey of discovery than it does a state of being. I am discovering who Jesus is for me in the life I live today – not my parents’ yesterday. Like learning how to skate, it is not easy – it takes persistence and sometimes can be painful. My faith is a process of learning what the Bible says, seeking to put it into practice and appreciating what I encounter through it all. The more I do all this, the more I can see that everyone puts their faith in something or someone. I have found a lot of personal satisfaction in putting my faith in Jesus. So what do you want to put your faith into? A high-paying job with lots of cruise ship vacations? A trophy wife (or husband) to look good at social events? Some kind of vague, superficial “just live a good life” philosophy? A real, substantial hope – based on the life, teachings, death and resurrection of Jesus – for something glorious and eternal when this life ends. Sound interesting? Then post your thoughts below and let’s have a conversation. Usually, when I encounter graphics on Internet atheism communities, they’re created by people who know the Bible as well (if not better) than many Christians. Sadly, whoever is responsible for this one is an exception. Now I’m not surprised that this truth was misstated. Many of us have heard it put exactly how it is in the graphic. But I’m sure you can see the significant difference. 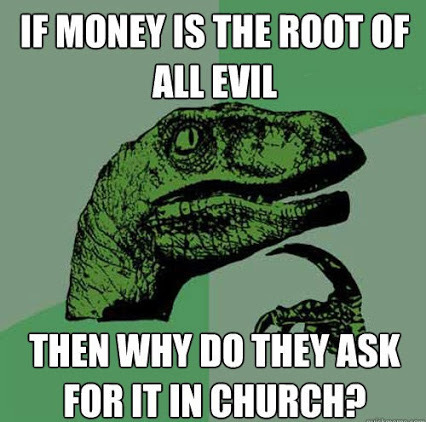 Money never has been and never will be the root of all evil. Jesus Christ, whom serious Christians believe is the Son of God, never said it was. The more you’ll do to get as much of it as possible. The more you’ll sacrifice in your family and personal life. The more you’ll turn a blind eye to the wrong things you do (and the right things you fail to do). The more you’ll listen to people who are similarly driven to get more. Think about all these things. The accurate Bible quote about money that I mentioned above kinda negates the question posed in this graphic. But I’ll tackle it just the same. 1. Jesus has nothing negative to say about giving to a “religious” institution. 2. He makes a very clear point about what giving really means. Beyond churches needing money to keep the lights on and (in Canada, where I live) the winter snow out of the parking lot, churches ask for money to do good. For example, the church I attend has a million-dollar annual budget to support more than 20 non-profit organizations. These organizations supply food to the hungry, help troubled teens, provide emergency disaster relief, support churches in the developing world and much more. Most churches that are truly committed to following Jesus are just like mine. God loves everyone — including the atheist who created the graphic that inspired this blog — so churches and the people who attend should show the same love. Do we fall short on this? Absolutely. But please remember: churches are not museums for saints; they’re hospitals for sinners. As far as I can see, every person on this planet is a long way from perfect. But by following Jesus and allowing Him to work in your life, you can come closer to sainthood. Interested? Yes or no, post your thoughts below and let’s have a conversation.